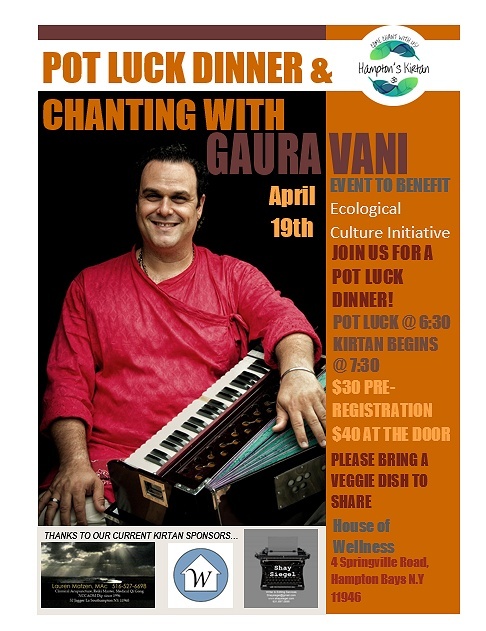 Subject: LongIsland.com - Your Name sent you Event details of "Chanting with Gaura Vani & Pot Luck Dinner"
Hampton's Kirtan invites you to join us in chanting with Gaura Vani & a Pot Luck dinner. We will be hosting a Pot Luck dinner at 6:30 followed by chanting at 7:30. Please bring a veggie dish to share. This event will benefit Ecological Culture Initiative.